Few words of explanation. Logic forms its own module in Wolffian philosophy. On the one hand, logic precedes all other sciences, because it introduces the very method used in all sciences. On the other hand, logic is clearly based on psychological considerations: to know how human cognition should work, we must know something about human cognitive powers. Because psychology is partly an empirical science, Wolffian logic, as described by Thümmig, must also have an empirical element. 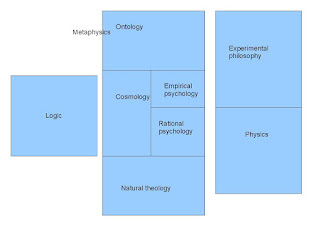 The second module in the picture consists of metaphysics. Here the foundation of the whole lies in ontology, of which it is difficult to say whether it is empiricist of rational – remember the controversy about the principle of sufficient reason. On ontology are based both cosmology and psychology, first of which deals with the sum of all complex objects and second of which deals with one type of simple object or soul. 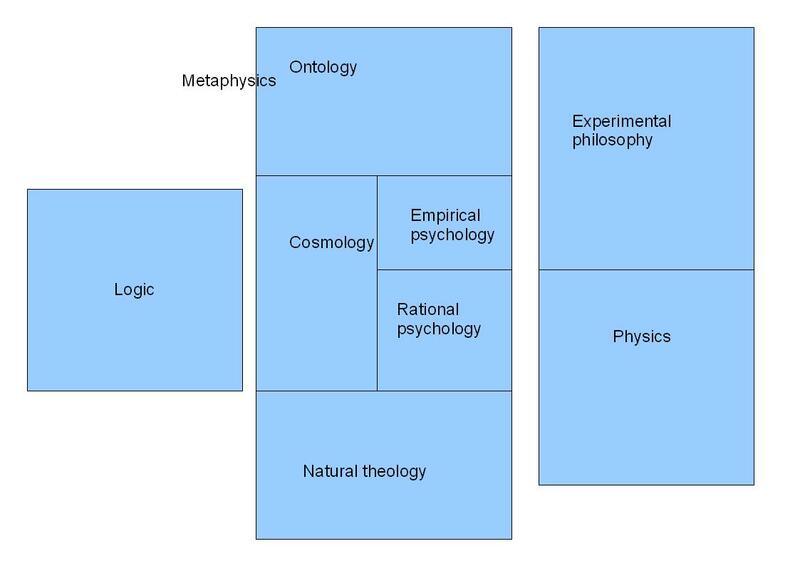 Both cosmology and psychology also have empirical foundations. In addition to the ontological theory of complex objects, cosmology contains also the highest generalizations from physical laws, clearly based on observations. Even more clearly, psychology contains an empirical part, which the so-called rational psychology then tries to explain. Furthermore, rational psychology is also partially based on cosmology, because psychology must explain the supposed interaction of the soul with its body, a complex object. Finally, natural theology is based on both cosmology and psychology – for instance, the existence of God is deduced cosmologically from the existence of the world and the soul. The final module of theoretical philosophy is then structured similarly as psychology. First, there is the so-called experimental philosophy, which contains results of the physical observations and experiments. The physics proper offers then a rational explanation for the content of the experimental philosophy , just as rational psychology was supposed to explanation of the results of empirical philosophy. Physics is also grounded on cosmology, which defines the most general laws governing the physical things. If we finally move to Thümmig's vision of the practical philosophy of Wolffian school, we may firstly note how the practical philosophy is dependent on the theoretical philosophy – logic is used to show how human being should use their intellectual capacities, ontology to define the concept of goodness, psychology to show what humans are capable of and theology to determine how humans should take God into account. The practical philosophy has then a general part, on which both of its major divisions are based. The aim of this general part is to establish natural law as the guiding principle of all good actions – all actions must aim towards perfection. 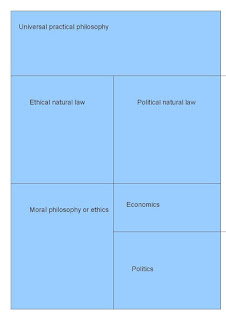 The natural law is then divided into two different sublaws, depending on whether the actions involve only a single human being or whether they involve also interpersonal relations. In the former case, the natural law determines the obligation for an individual to perfect one's intellect, volition, body and external state, while in the second case natural law commands members of a community to make other members as happy as possible and the community in general as prosperous and tranquil as possible. 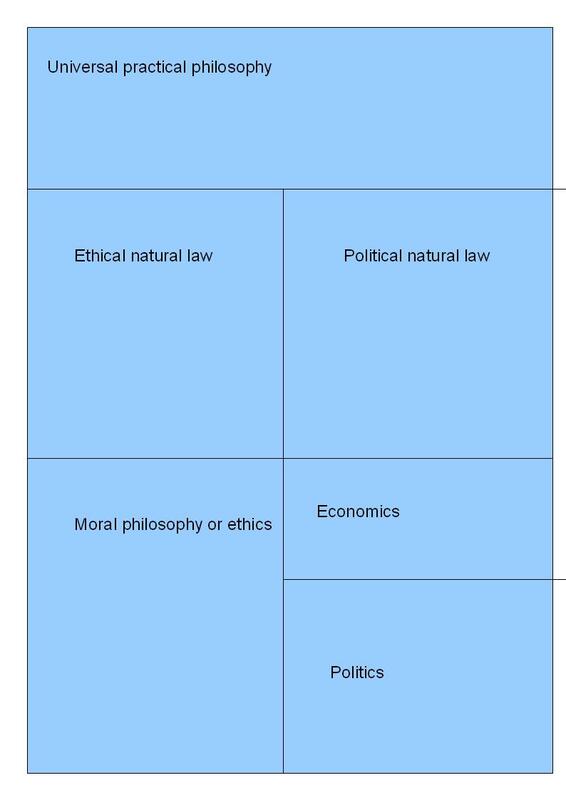 The former aspect of natural law is then the foundation of moral philosophy or ethics, which is then nothing but a system of rules for making oneself perfect. The latter aspect, on the other hand, is the foundation of civil philosophy or politics, which is divided into two parts. The first part or economics deals with the prosperity of simple communities or households, while the second or politics proper, which is also based on economics, deals with the prosperity of communities consisting of households, that is, republics. Thümmig has thus made two additions to the Wolffian practical philosophy: firstly, he has introduced the idea of a general practical philosophy, and secondly, he has divided the ethics and the politics into two parts, first of which investigates the primary goal of these disciplines and the second of which determined the practical measures for obtaining those goals. When it comes to details, Thümmig fails to make any substantial additions to what Wolff himself had said in his works on ethics and politics. This leads us naturally to the question of the role Thümmig played in the development of German philosophy. I shall endeavor to make similar concluding remarks on every philosopher, once I get to the last text I read from them. The texts of Thümmig considered thus far have had little of lasting interest. In addition to Institutions, he has edited one collection of Wolffian articles and authored a book on scientific curiosities and an article defending Wolff's German metaphysics. Even the Institutions, which has been clearly the main publication of Thümmig, has been mostly a mere summarized translation of Wolff's works. Of course, Institutions still was important for the Wolffian school, because it presented the doctrine of the school for the very first time in the international language of the time. Furthermore, it is clear that Wolff and at least other Wolffians took Thümmig seriously and referred to his writings various times. Indeed, it is just to be expected that a promising young philosopher follows for a time the writings of his mentor closely, before breaking into some truly new territory. Thümmig never really had the chance to break away from the shadow of Wolff, because he died rather young in 1728. Still, in light of Thümmig's writings it is difficult to say whether he could have really changed the tone of Wolffian philosophy. He does introduce novelties, but these novelties are not so much reformations of Wolff's doctrines, but merely additions concerning issues Wolff had not discussed – think, for instance, of Thümmig's fascination with animal psychology. In contrast with later Wolffians, like Baumgarten, Thümmig is more like a person who applies a theory to new fields of investigation, while the later Wolffians sometimes even disputed the theory and the axioms on which it was based – not to mention Kant, who replaced even the methods and aims of philosophy. So much for Thümmig, next time we shall find out the purpose of the world.